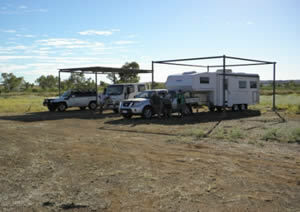 Barcaldine "Lara Wetlands Camping Grounds"
Hi All! My name is Bob Kelly. I am a Vietnam Veteran, served in 1969, at present I am camped up at my nieces place in Barcaldine called "Lara Wetlands Camping Grounds,", this is on a private cattle station, we are in the process of setting up a camping ground on her property, and would like to invite all Veterans to come and visit and enjoy this beautiful part of Paradise. Fresh Artesion drinking water, hot and cold showers, flush toilets, unfortunately no powered sites yet, but generators are welcome. Ph No: 07 46511619 or Mobile 0457661243. Michael & Jo Wills are the owners of this Station called Lara. 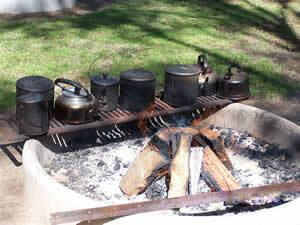 Camp Hart and is in Kulin Western Australia. It is about 4 hours from Perth. Kulin has their Bush Races in October and we usually have a full house then, but the camp is open to all Veterans and their families. 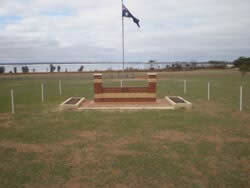 You can also go to the Kulin Bush Races site and click on Camp Hart. Cockatoo Rise retreat is situated 5.75 klms from Bairnsdale in the Gippsland lakes region . 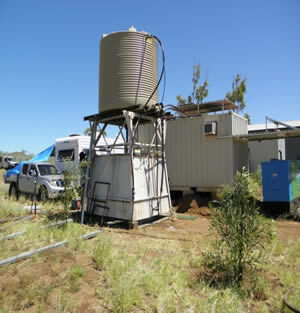 The retreat has powered caravan sites with water , all supplied , camping sites at " Diggers " barby , toilet and water , plus shelter . A 9 hole golf course is available for those who want to have some fun . The golf course is available to travelling Vets and partners with all RSL members . A donation to help with running costs is appreciated . The Gippsland lakes has magnificent fishing with the sea and rivers also near by BAIRNSDALE HAS A VERY GOOD SHOPPING CENTRE WITH ALL FACILITIES . tel bookings Greg 0409418332 Dogs allowed by discussion with Greg . A low nominal fee is charged (EFPOS available) each day for both Veterans staying at the homestead and for caravan parking. The homestead provides six bedrooms, large kitchen, laundry, workshop, BBQ area, 240V mains power, Satellite TV, Plenty of water and a billabong full of fish and redclaw. Keen to get outside and you'll find opal fossicking, and bird watching and plenty of space to explore. Well it finally happened the freeholds for the Mootatunga/Karte bush retreats have been issued and the club is now processing titles to the individual block owners. There are many people to thank for this event and acknowledgements will be made in due course. A page for this site is under construction which will have photo's of the Mallee towns and put to rest the image some have of a desert wasteland. ). There are caravan & camping sites, There are no powered sites. 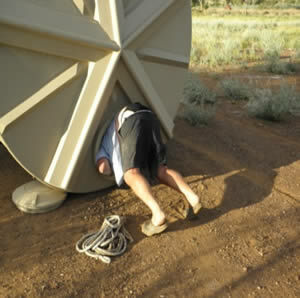 The camp has an ablution building with two flushing toilets and a battery powered shower. You need to heat your water and fill the bucket for your shower. 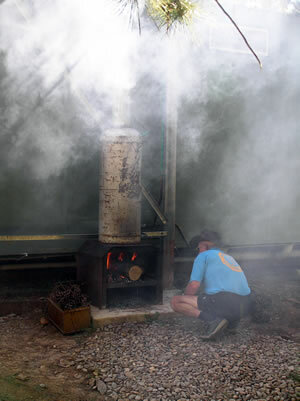 There is a camp kitchen which is screened to keep the bugs out. There is one frig and gas oven. A 6.5Kva generator for power. Set in the hills on the southern side of Mt Wheeler. Road access via two-wheel drive and only 30 minutes from Rockhampton. Cockscomb provides a quiet place away from the city, away from all mod cons, a quiet relaxing place to go when you want to get away and get back to some basic living and quality time. Veterans Retreats of Western Australia is a non-profit organisation with the objective of providing a safe and quiet environment for Veterans of the Australian Defence Force, Police Force, Fire Brigade, and Ambulance. Veterans Retreats of WA Inc is the manager of Meentheena, a retreat for all ex military and para military personnel to get away from it all and recharge the batteries. 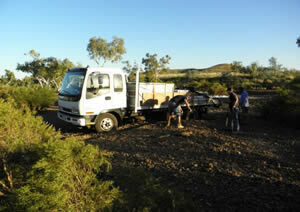 VRWA has secured a license over a section of Meentheena Station, to the East of Marble Bar, on the Rippon Hills road. The section of the station is 695,000 acres and was originally used for cattle breeding. The Nullagine River flows through the million acre station, sometimes underground, and there are billabongs with clear water and big fish, making it ideal for camping. The scenery is breathtaking. The Website and Facebook pages will each show you photos of the locations you can camp, or there are dongers for veterans use if you don't have your own rig. Shades have been set up for parking caravans, camps etc, or head out onto the run and pick a spot along the river. Lots to choose from. There is abundant wildlife (as well as cattle and camels) and bird life to see and photograph, hills and old homestead sites to explore, fish to catch, or just plain relax in spectacular surrounds. Metal detecting is also a favoured pastime. The camp site is still being established, so if you would like to volunteer some time to assist, your assistance will be willingly accepted. But if all you want to do is relax, explore or chill out, then you are welcome to do that too. Everyone is welcome. Best months are from April to September. Drive to Marble Bar, stock up on supplies and head approximately 80 km east on the Rippon Hills Road. If you come to the Nullegine River, you have missed the turn approx 4 km back. The track into the Camp site is approx 8 kms. Watch for the sign at the turn. I now live in WA and can be contacted on Email or 0429 101 357 when in Australia. I now spend about four months each year in Ba Ria – Vung Tau Province (formerly Phuoc Tuy Province) and am involved with Australia Vietnam Volunteers Resource Group (formerly Australian Veterans Vietnam Re-construction Group founded by Paul Murphy in 1994 as a veterans aid group)....AVVRG. Would be delighted to hear from Vietnam Vets who would like to visit Vung Tau, etc. Can put them in contact with local vets who live in Vung Tau; advise on accommodation, arrange visits to Long Tan Cross and tour our aid projects in the region. Membership of AVVRG is only $20.00 per annum. Can forward membership forms. 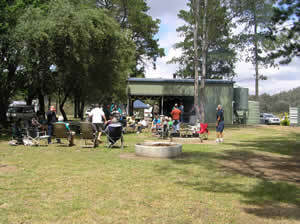 Murraguldrie Veterans Retreat run by V.V.A.A. South West N.S.W. 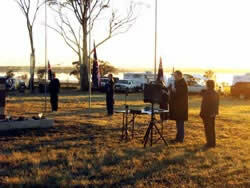 & Wagga Inc and managed by the Sub–Branch committee, the retreat is now open and Veterans of all wars and conflicts and peacekeeping missions are most welcome this includes family members. 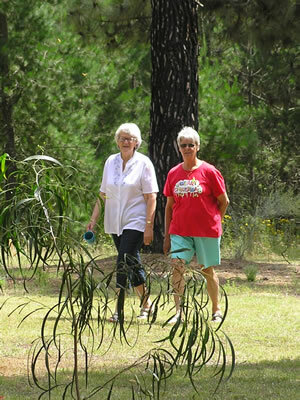 The retreat is located in the Murraguldrie State Forest and the entry to the retreat is 7km east of the Hume highway on the Wagga Tumbarumba Road (55km from Wagga Wagga and 45Km from Tumbarumba). It’s close proximity to the Highway and nestled in the foothills of the “Australian High Country” and only a short drive to the High Country towns and dams with their spectacular scenery has seen many visitors change their previous travelling routes to include the retreat and this has seen most of our retreat visitors returning on numerous occasions. 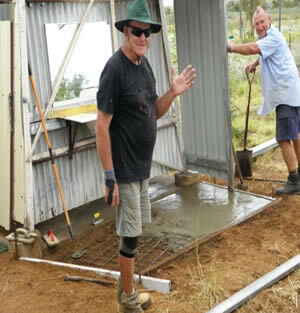 The retreat is now nearly at completion with a shelter shed with kitchen facilities, Toilet/Shower block with a “Donky” hot water system, and an almost completed “Donga” where you can drop your swag for an overnight stay. We are in the process of upgrading the toilet facilities to include a disabled toilet/shower to cater for some of the Veteran with limited mobility. The retreat has only tank water so please use it sparingly; likewise the wood is cut by the local veterans who are all getting older. In the summer the Forestry will displays “fire ban” signs and we also place one on the entry; so when these are displayed there is NO LIGHTING OF SOLID FUEL FIRES ON TOTAL FIRE BAN DAYS. The entry gate to the retreat is locked, so to gain access to this retreat you need to contact one of the three designated retreat contacts whose names are below. They will inform you about the retreat and any restriction in force during your intended visit. Since this sub-branch is required to carry the public liability insurance for the retreat we need to record your name in our register if you are not a members of the sub-branch; however all people using the retreat must sign the visitors book and peruse the retreat rules which are located in the shelter shed. The current management team of the Ramon Deed Veterans Retreat is Michael Chopping,President is still Michael Chopping, the Secretary and Caretaker is Barry Langan and the treasurer is Rob Lauder. Location is as shown with directions as follows:- Coming from Mildura, on the outskirts of Dareton (at the change in speed limit) turn left in to Tallawalla Road then after approximately 1km turn left into Scout Road. The retreat is 500 metres up Scout Road. The cost per night Cost as per flyer is $20 per night or $120 per week for powered sites and $10 per night or $70 per week for unpowered sites. Ramon John Deed 3788300 Born 25 July 1945, 1 Fld Sqn, Vietnam 13 March 1967 to 10 May 1967 was from Mildura and went to both primary and secondary schools with other local Veterans. He died at the US Evac Hospital Long Binh 10 May 1967 from wounds received from a mine incident at the Horseshoe the previous day. 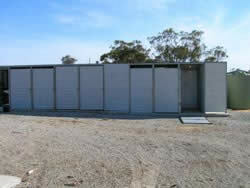 This facility has a clubhouse, caravan slabs, Hot & Cold showers, Septic Toilets and Laundry. RSL Gemfields Sub – Branch Inc. Located at Sapphire behind the Post Office. One acre of land, several power points, water connection points, a hospital grade kitchen and gas BBQ. Bar opening times are now Thursdays 3.00pm to 8.00pm, Saturday and sundays 2.00 pm to 8.00pm, The club now offers meals at a reasonable price Thur, Sat & Sun. Cost is now $15.00 a day or $100.00 per week. We now have a coin operated washing machine. There is generally no need for pre bookings. Where all Vets and family are welcome to pull up your van / motor home and break your journey for a short time. 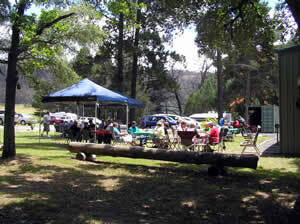 Standown Park is situated half way between Tin Can Bay and Gympie on the Tin Can Bay road. We are two hours from Brisbane and less than one hour from Maryborough. 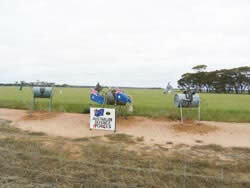 Bublacowie Military Museum and Memorial Gardens is owned and operated by ex Vet Chris Soar BM. Chris has an excellent military and civilian museum which he has built up over many years. In the Memorial Garden, WW1 military members are laid to rest and plaques are displayed of those who have given the ultimate sacrifice in various conflicts. The museum is so packed full of treasures, it will take a few hours to take all in. Entry is $8 for adults and $5 for children under 12. 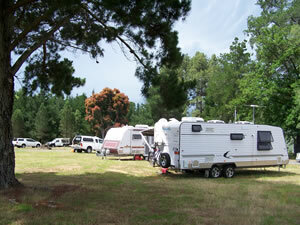 There is limited space for military members, serving or not, to park your caravan at the back of the property. Power, water, showers and toilets are available. Maximum stay is 3 days or as arranged with Chris. Cost per night is $18 per site. Whilst you stay, if you can lend a hand in maintaining the establishment, it would be gratefully appreciated. A map of the area, with directions, is attached. Vets are invited to rest by 60 km of the magnificent Roper River. Camping is free, there is fresh water in the river, with lots of peace for regeneration. Protocol: The same as for Pandanus Park ie take only photos, leave only footprints, you are totally responsible for yourself and there is absolutely no liability for Elsey Station or its residents. Ensure that you have medical clearance, and that you bring everything you might need. Bookings : Please use the format as in shared files on the MC2 site re “Bookings for Roper Retreat” and email details to ROPER, or request a booking form by email. If unable to successfully email phone Tony 0401 100 514 or Jimbob 0419 414 909 for assistance. Where is it? 31km east along the Roper Highway, Northern Territory. Turn north at the Elsey Station sign. 3km later you will pass the Manager's house, and just 5km later you reach the Roper. How much dirt getting in? Only eight km. Yep, you read it right. You don't even need a fourby. Communications Local communications are UHF channel 6 Duplex using the local repeater. After establishing communications it is suggested vets move to another channel for general chit chat. How's the fishing? There are plenty of barra, seratoga and black bream - all great eating - and even catfish, if that's your fancy.